One of my greatest pleasures comes from making learning activities that I save tons of money on by making them at home instead of buying them at the store. 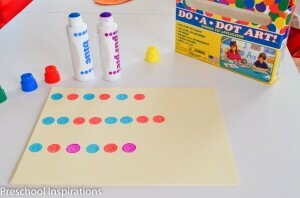 I have boxes of patterning games for my preschool class that we use for math practice, but one day I realized that it would be so simple to make my own! 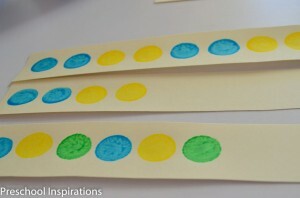 After finding materials that I had around the house, we soon had some of our very own DIY pattern strips. It’s super easy to do — I promise! I thought that our counting bears would be the perfect addition to this activity. 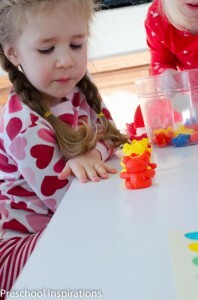 It probably has something to do with the fact that I am slightly obsessed with how fun they make learning. What I love about making my own is that I can easily decide how easy or complicated to make the patterns! We have patterns that are ABAB, AABB, AABAAB, AAABBB, ABCABC, ABBA, and more. 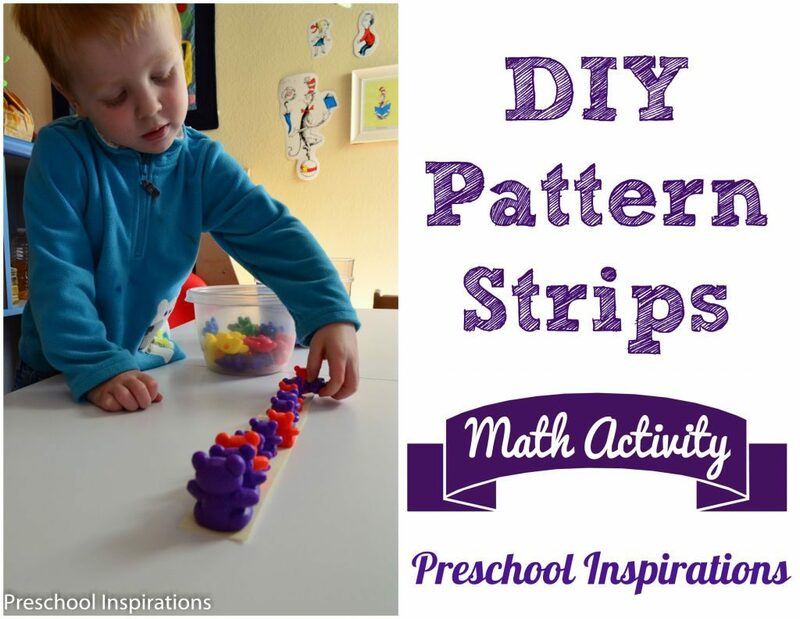 Some of them span the entire strip, while others just have enough of a pattern to help the child get started. 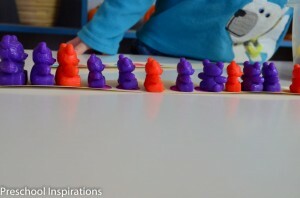 These are definitely a favorite patterning activity. They’re actually getting much more attention than the ones I bought. Go figure! 1) Cut out equal sized strips from card stock paper. I do recommend cutting the strips as the VERY first step…even though that’s not the way I did it in the picture. 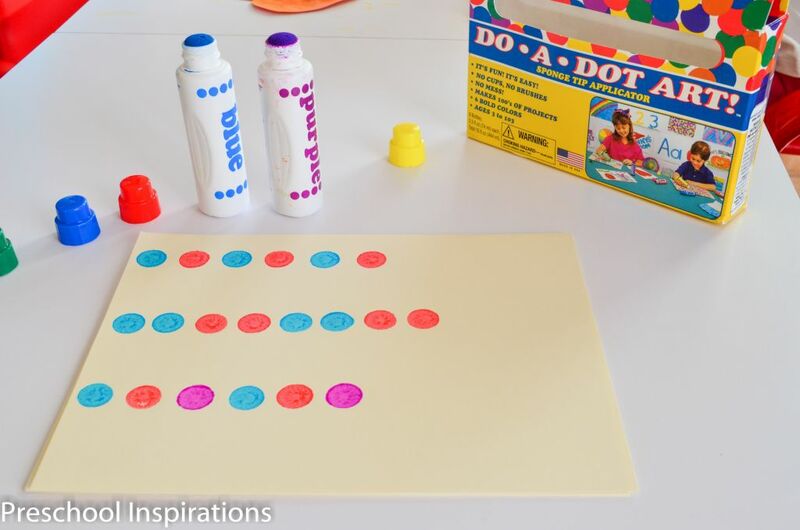 2) Use do a dot dabbers (bingo markers) and make some patterns. Feel free to laminate these for extra durability! 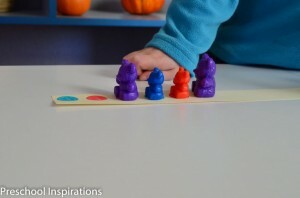 3) Find objects to use as place markers. In the pattern strip boxes I bought, I have some shapes. They could easily be made by cutting shapes out of paper or thin cardboard. 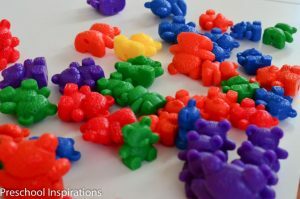 I, of course, highly recommend using counting bears or any other type of counter animal. I hope you and your little ones enjoy this truly fun and easy math activity! Thanks for linking this great idea up to our Share It Saturday! We will feature it in tomorrow’s post!